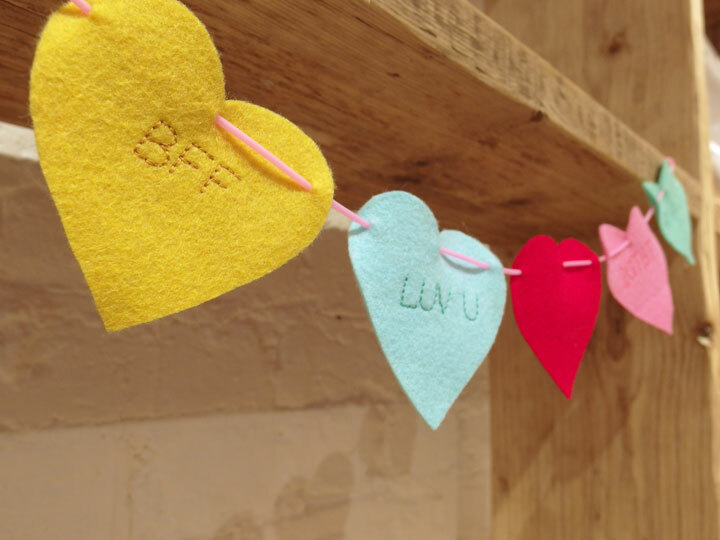 It’s Valentines Day this Saturday, and to inspire you to get creative, we have written a tutorial below to make an easy felt heart garland. To go with the tutorial, we also have heart felt garland packs to giveaway in store to the first ten people who ask! Bunting and garlands are a fun way to change the look of a room, and we decided to make one with a heart motif for Valentines Day. This project is really easy to make with children, so we used one of our embroidery machines to add slogans to our hearts that are in “text speak”. The lettering function is something that quite a few of our sewing machines come with. It is easy to use, and really handy for making quilt labels and personalising projects. If you have never used the lettering function grab your manual and read up on it – get the full potential from your machine! If you don’t have the facility to do lettering on your machine, you can hand embroider, or write the words. You can also try out some decorative stitches to add pattern. 1. Cut felt hearts, any size you wish. We added buttons and text. 3. Hand stitch the hearts to a piece of cord or ribbon.